For seven days, the Marine Microbial Ecology Group will participate in the Deep-Sea Eukaryotic Life Expedition aboard the R/V Western Flyer. 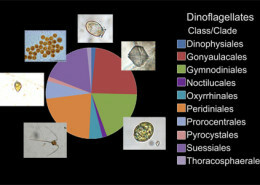 The researchers are investigating the diversity, activities, and interactions of marine microbes in the deep sea and the euphotic zone (the layer of the ocean that receives sunlight). 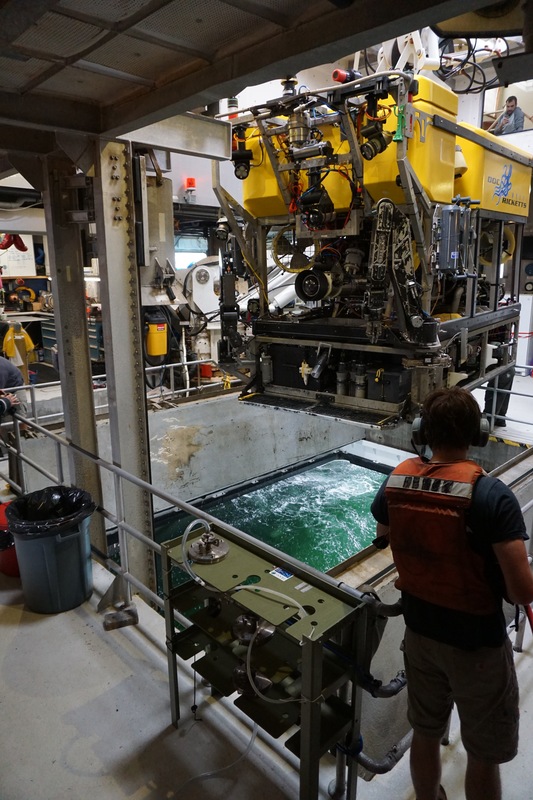 The researchers will collect samples using push cores, a water sampler designed at MBARI, and a conductivity, temperature, and depth (CTD) rosette. 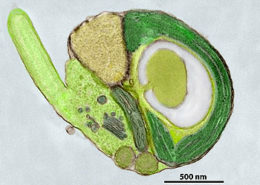 Picoeukaryotes are very small eukaryotes—organisms that, unlike bacteria, contain cells with well-defined internal structures called organelles. 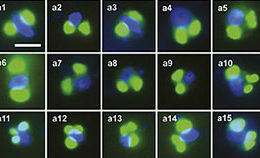 During an algal bloom, the interactions between picoeukaryotes and bacteria influence processes such as primary production and remineralization. The researchers will identify an algal bloom during the expedition and collect water samples in the center of the bloom and from nearby surface waters. 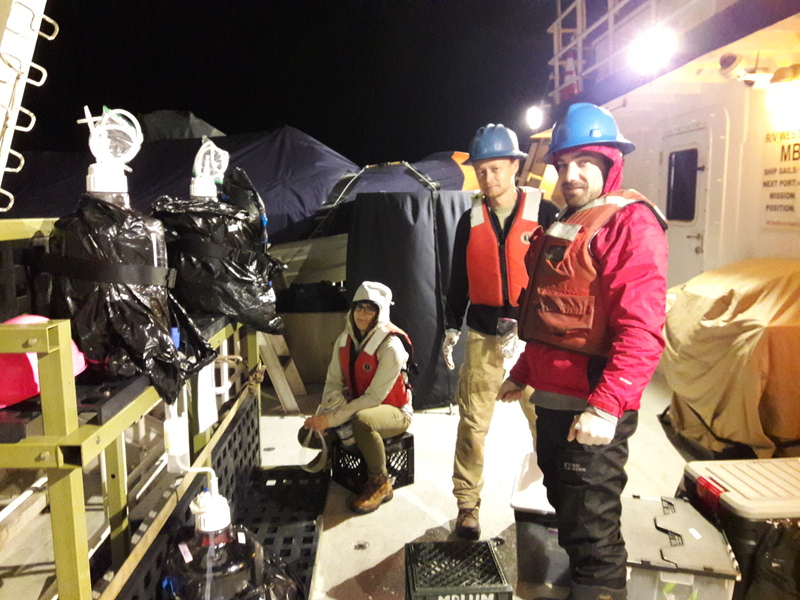 In addition, the researchers will collect deep-sea invertebrates with remotely operated vehicle (ROV) Doc Ricketts to study their microbiome (the community of microorganisms). Specimens will be photographed, dissected, and immediately flash frozen in liquid nitrogen for later genomic analysis. 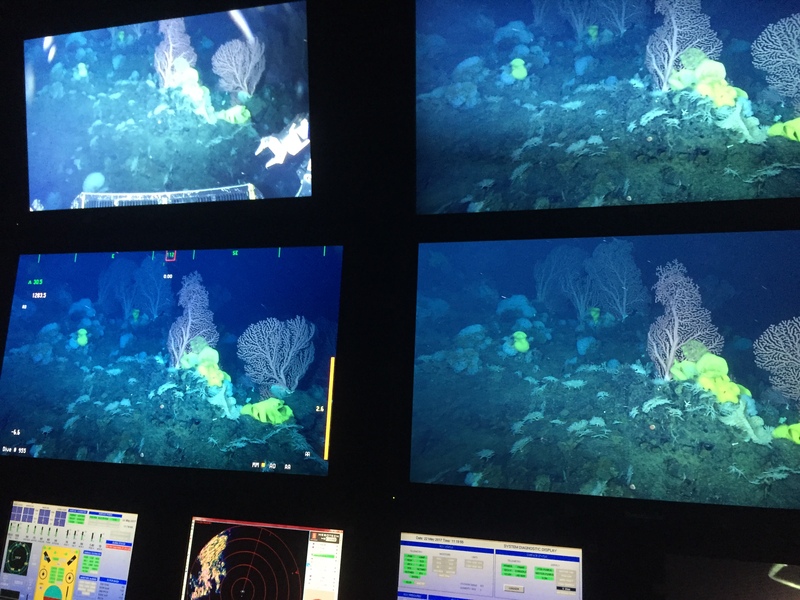 Today Co-Chief Scientists Sebastian Sudek and Charmaine Yung directed the ROV Doc Ricketts to observe and collect deep-sea benthic invertebrates, such as sponges and corals, at the Davidson Seamount so we can study their microbiomes. 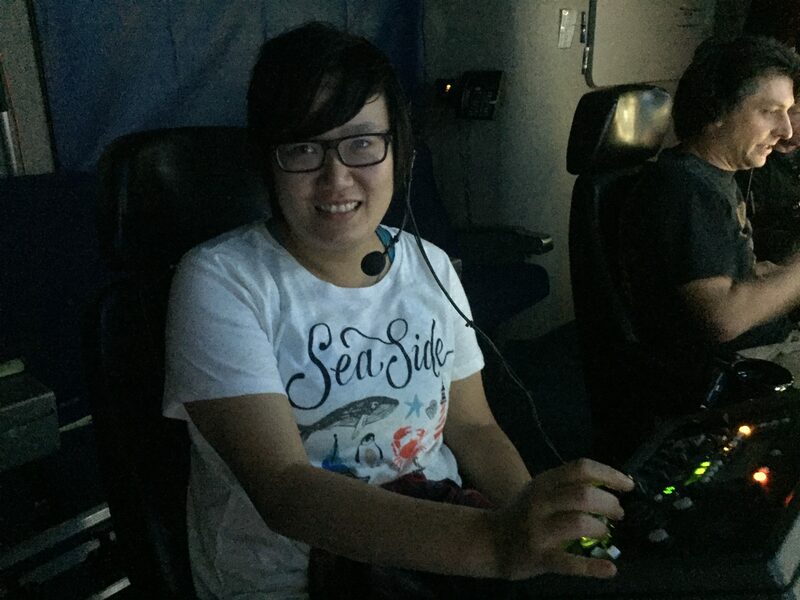 Co-Chief Scientist Charmaine Yung and ROV Pilot Ben Erwin in the control room during today’s dive. During the ROV Doc Ricketts dive, we saw these corals and sponges at Davidson Seamount. Today we also accomplished the deepest deployment ever of the in situ ultraviolet spectrophotometer (ISUS), a sensor developed at MBARI. The sensor measures nitrate, an important link in the nitrogen cycle of the ocean. It returned data from a record-breaking 3,500 meters depth; we are still waiting to parse the data. We thank developers Ken Johnson and Luke Coletti for loaning us the sensor and helping us set it up. One of our goals today was to find and sample a large phytoplankton bloom to study phytoplankton and bacterial associations. Although blooms often occur in the spring, they can be hard to predict, and the ocean doesn’t give its secrets away easily! Fortunately, we identified a large bloom using observations from satellite chlorophyll sensors in space and measurements of fluorescence taken with the ship. The bloom covered a large region of the ocean and was about 50 times the typical chlorophyll values for the region and about 10 times the current levels of the surrounding waters (in the bloom the chlorophyll level was 20 micrograms per liter). Charmaine Yung, our co-chief scientist, will assess the phytoplankton and bacteria in the samples collected in the bloom. She is in the process of trying to culture them as well. 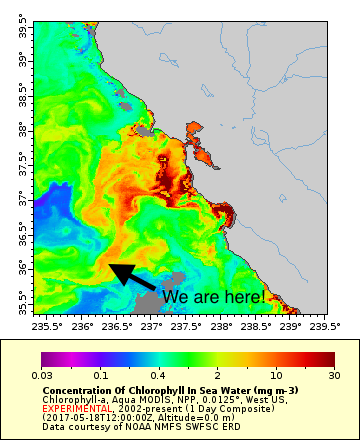 This image (courtesy of NASA’s MODIS satellite) shows chlorophyll concentration in the ocean. We are located in an area with a high concentration of chlorophyll, a signifier of a phytoplankton bloom. Today we had a second successful dive with the ROV Doc Ricketts. On this dive to 3,600 meters, we retrieved the seafloor incubation experiments set out by Maria Hamilton the day before, and collected 20-centimeter-long sediment cores for Rachel Harbeitner Clark’s research. With many cores coming on board at once, many members of the science team pitched in to help process these cores, getting muddy in the process. Each core was photographed, and then samples were taken for microbiology and geochemistry analyses. Researchers will identify the active microbial communities within the cores (via the microbes’ DNA) and determine the substrates that fuel their growth. While the microbes’ primary source of energy is exported from the surface ocean over three kilometers away, thankfully, we researchers aren’t that far from our food source; meals on board the ship have been excellent. After the sediment cores are collected, each one is photographed for future reference, as shown in this image. Photo by Charmaine Yung. 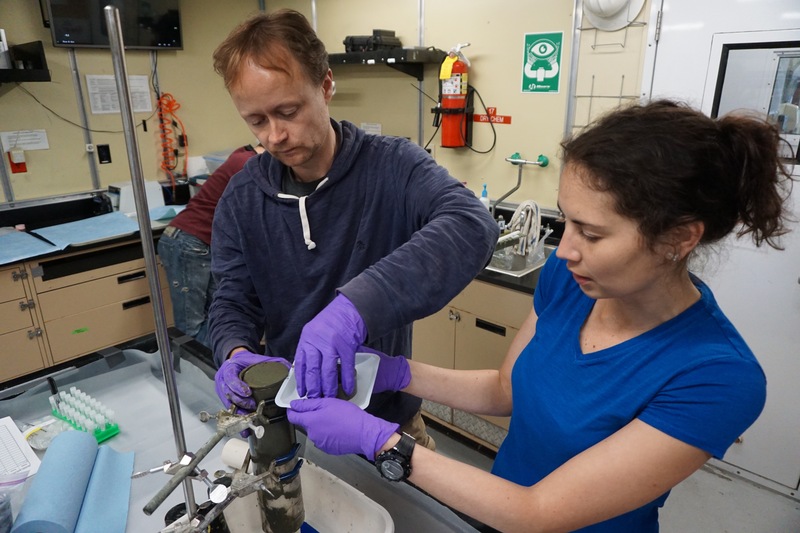 Co-Chief Scientist Sebastian Sudek and Rachel Harbeitner Clark collect a subsection of a sediment core for microbiological analysis. The sample was collected from 3,600 meters below the surface. Photo by Charmaine Yung. 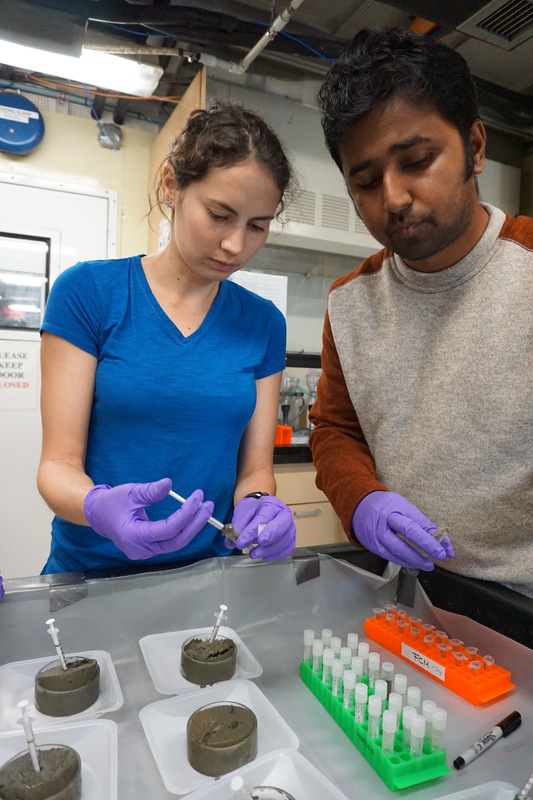 Rachel Harbeitner Clark and Mohammad Moniruzzaman collect samples from subsections of a sediment core for more microbiological analyses. Photo by Charmaine Yung. 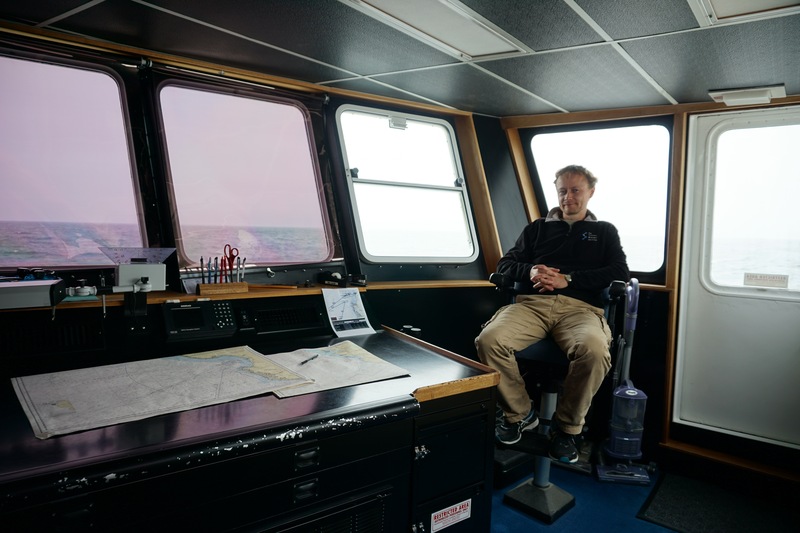 Co-Chief Scientist Sebastian Sudek on the bridge of the R/V Western Flyer. The first day and a half of our cruise was busy and exciting. 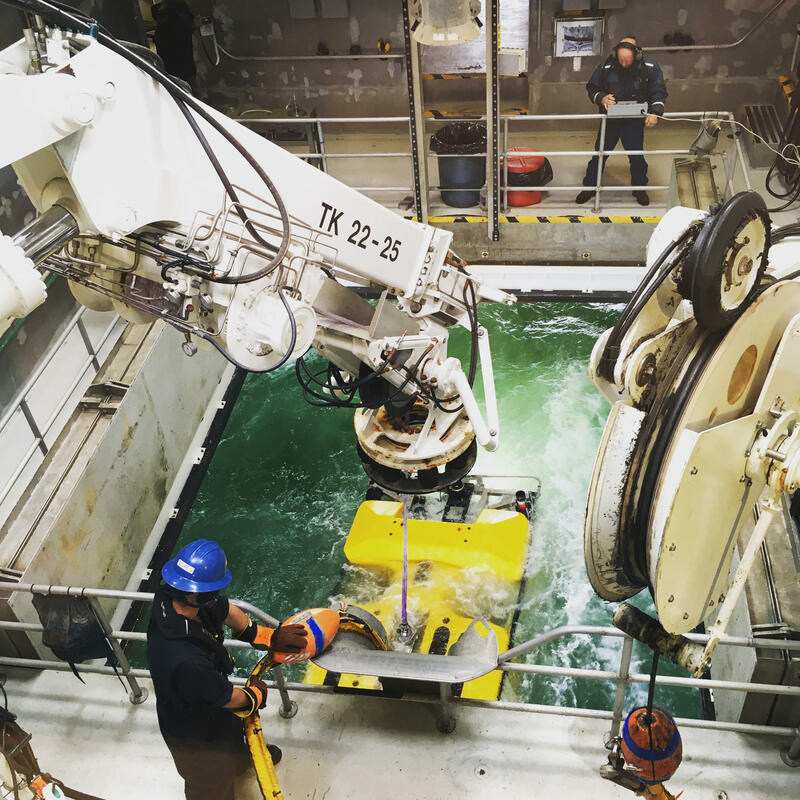 After an initial delay of six hours due to rough seas and strong winds, we had a successful deployment of the ROV Doc Ricketts aboard the R/V Western Flyer. 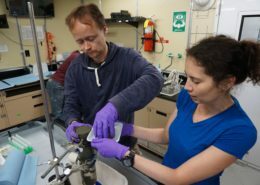 With the help of the robotic arms of the ROV and the skilled hands of the ROV pilots aboard the ship, Rachel Clark and Maria Hamilton led studies to understand the fate of phytoplankton at the seafloor, 3,600 meters below the sea surface. (from left to right) Maria Hamilton, Sebastian Sudek, and David Needham on the deck of the R/V Western Flyer. The ROV Doc Ricketts is deployed and recovered through the moonpool of the R/V Western Flyer. A crane is used to recover and deploy the ROV Doc Ricketts. At the surface, we found that the waters near Monterey Bay were very rich in phytoplankton, as part of an ongoing spring bloom! Overnight, Mohammad “Monir” Moniruzzaman set up an incubation experiment to improve our understanding of how vitamins control the activity of phytoplankton. 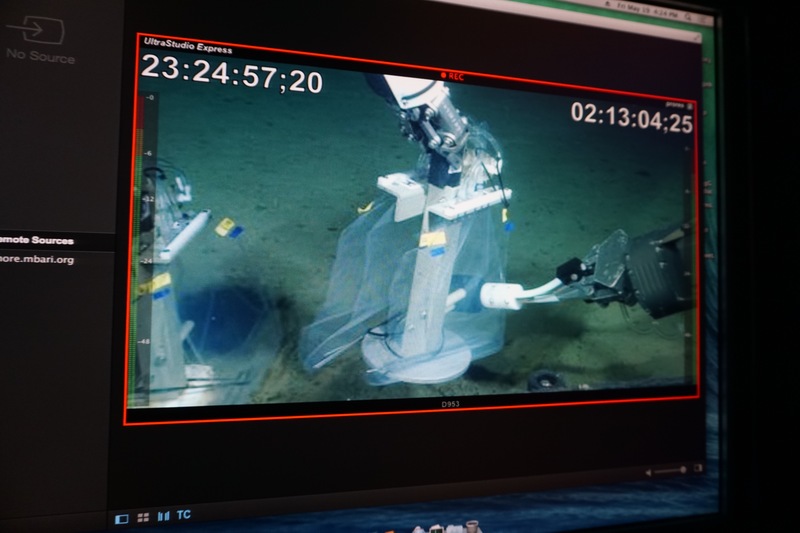 A deep-sea in situ incubation sampler is filled with seawater at a depth of 3,600 meters using the ROV. 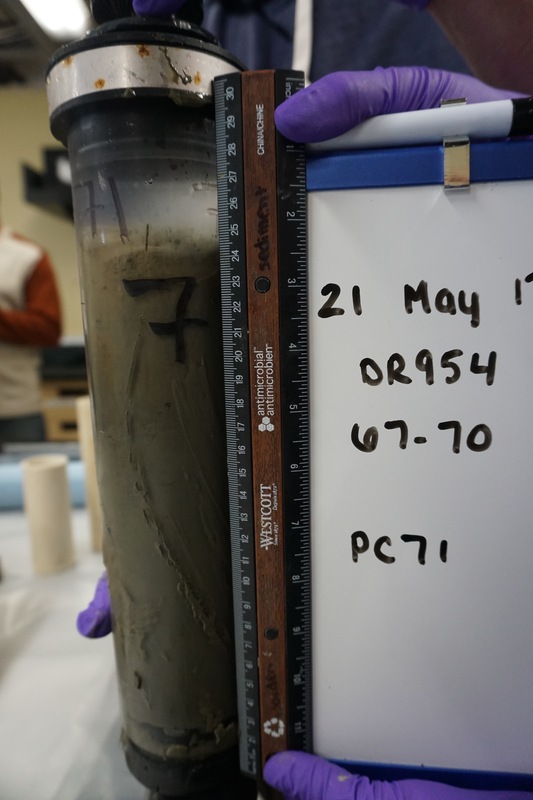 This experiment is designed to understand which deep-sea microorganisms consume sinking organic material.